The Total Myth of Ocean Acidification | Watts Up With That? When it comes to debunking Gorebal Warming, Chicken Little of the Sea (“ocean acidification”) and other Warmunist myths, my favorite starting points are my old college textbooks. Way back in the Pleistocene (spring semester 1979) in Marine Science I, our professor, Robert Radulski, assigned us The Oceans by Sverdrup (yes, that Sverdrup), Johnson and Fleming. Even though it was published in 1942, it was (and may still be) considered the definitive oceanography textbook. I looked up “ocean acidification” in the index… It wasn’t there. The notion that CO2 partial pressure influences the pH of seawater isn’t a new concept, *surely* ocean acidification must have been mentioned in at least one of my college textbooks. When the pH of seawater decreases, calcium carbonate dissolves. In warm, shallow seas, at a pH of about 8.3, dissolution of aragonite and calcite particles by inorganic processes is almost nonexistent. 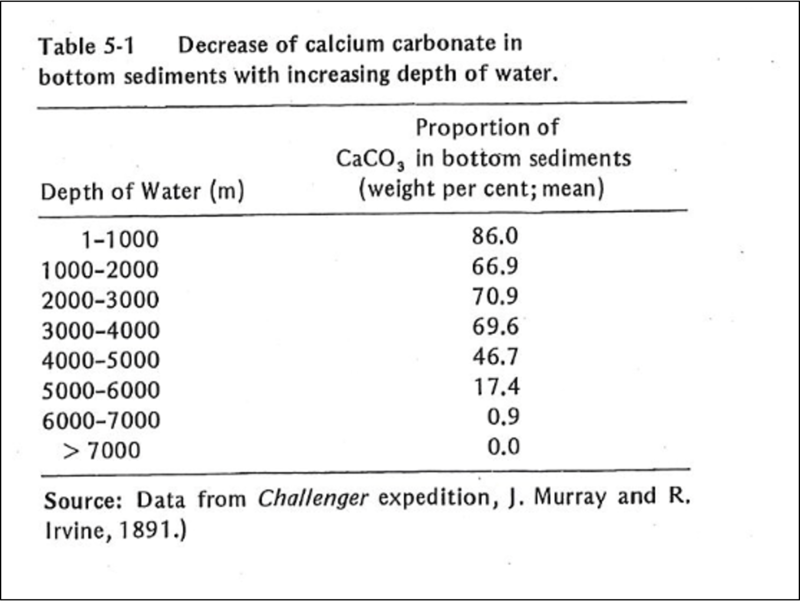 However, since the classical studies of the Challenger expedition, it has been known that the proportion of calcium-carbonate particles in seafloor sediments decreases as depth of water increases (Table 5-1). Such decrease is particularly rapid at depths between 4000 and 6000 m. Although the reasons for this decrease have been debated, the evidence suggests that calcium carbonate dissolves because the CO2 concentration increases with depth. The control on CO2 appears to be part biological; it results from biological oxidation of organic-carbon compounds. Also, the water masses at greater depth were derived from the polar region; their temperature is lower and the water contains more dissolved CO2. Increased concentration of CO2 is in turn reflected by lower pH, which leads to calcium carbonate dissolution. However, the increase of pressure with depth may also be involved; such increase affects the dissociation of carbonic acid (Eqs. 5-11 and 5-12). The depth at which the calcium-carbonate decreases most rapidly is known as the carbonate-compensation depth, defined as the depth at which the rate of dissolution of solid calcium carbonate equals the rate of supply. Friedman and Sanders, pages 133-134. A very thorough, easy to read, description of the relationship between CO2 and seawater pH… However, the phrase “ocean acidification” is notably absent from the entire 300+ pages. How is this possible? Even way back then, we knew that past atmospheric CO2 concentrations were often much higher and the oceans had oscillated between calcite and aragonite seas during periods of high and low atmospheric CO2 concentrations. Dr. Drobnyk was the department chairman and he assigned us a brand new textbook… Friedman & Sanders was published in 1978… Surely ocean acidification just had to be mentioned in it. Why wasn’t the relationship of CO2 and pH called Ocean Acidification prior to the Gorebal Warming Myth? Because seawater cannot become acidic (at least not under real world conditions) and Communism was sufficiently scary as far as bureaucrats were concerned, prior to the end of Cold War I. A study of seawater pH near active volcanic CO2 vents in the Mediterranean (Kerrison et al., 2011) found that the pH immediately adjacent to the vent was still alkaline, despite being subjected to the equivalent of nearly 5,600 ppm CO2. CO2 fugacity vs pH. Data from Kerrison et al., 2011. Partial pressure and fugacity (μatm) are a little lower than what the mixing ratio (ppm) would be, depending on temperature and humidity. However, they are close. A partial pressure (pCO2) of 350 μatm generally equates to about 350 ppm in the atmosphere. At nearly 5,600 ppm CO2 the seawater was still alkaline, not acidic. Straw man! The “ocean acidification” hypothesis clearly states that the oceans won’t become acidic. Just as we describe an increase in temperature from -40°F to -20°F as warming, even though neither the starting nor the ending temperature is “warm,” the term “acidification” describes a direction of change (i.e. increase) in the level of acidity in the global oceans, not an absolute end point. When CO2 is added to seawater, it reacts with water to form carbonic acid (H2CO3); hence acid is being added to seawater, thereby acidifying it. Similarly, in the example about human blood, a drop in pH is referred to as acidosis, even though the point where acidemia begins (7.35) is still above 7. That’s all well and good. It’s even true-ish… However, the science of seawater geochemistry has been around a long time. The relationship between CO2 and pH has been observed for a long time. Why did they suddenly fabricate the phrase “ocean acidification” to describe this process? Because “people” are almost as afraid of acid as they are of radiation. However, while the chemistry is predictable, the details of the biological impacts are not. Although scientists have been tracking ocean pH for more than 30 years, biological studies really only started in 2003, when the rapid shift caught their attention and the term “ocean acidification” was first coined. What we do know is that things are going to look different, and we can’t predict in any detail how they will look. Some organisms will survive or even thrive under the more acidic conditions while others will struggle to adapt, and may even go extinct. Beyond lost biodiversity, acidification will affect fisheries and aquaculture, threatening food security for millions of people, as well as tourism and other sea-related economies. Scientists have been tracking ocean pH for more than 30 whole years! Wow! 30 fracking years. That’s like a whole geological nanosecond! What we do know is that things are going to look different, and we can’t predict in any detail how they will look. We have a pretty good idea how things will look… They will look very much like they do today. While biogeochemical and physical processes in the Southern Ocean are thought to be central to atmospheric CO2 rise during the last deglaciation, the role of the equatorial Pacific, where the largest CO2source exists at present, remains largely unconstrained. Here we present seawater pH and pCO2 variations from fossil Porites corals in the mid equatorial Pacific offshore Tahiti based on a newly calibrated boron isotope paleo-pH proxy. Our new data, together with recalibrated existing data, indicate that a significant pCO2 increase (pH decrease), accompanied by anomalously large marine 14C reservoir ages, occurred following not only the Younger Dryas, but also Heinrich Stadial 1. These findings indicate an expanded zone of equatorial upwelling and resultant CO2 emission, which may be derived from higher subsurface dissolved inorganic carbon concentration. Using our revised calibration, we reconstructed pH from our new δ11B measurements on Tahitian corals, as well as from previously reported data11 from both the Marquesas and Tahiti, and the overall result is consistent with the WEP foraminifer δ11B variations10 (Fig 3a and b). The oldest coral sample, dated to 20.7 ka BP during the last glacial maximum (LGM), exhibits a relatively high pH (8.26). From 15.5 to 9.0 ka BP, pH is generally constant within uncertainty (8.15–8.22) and consistent with the preindustrial value of 8.20. Four notable pH excursions are associated with HS1 and the YD. Two of our samples exhibit anomalously low pH at the end of HS1 (8.13 at 15.15 ka and 8.09 at 14.99 ka BP), in addition to those at end of the YD at the Marquesas11. The low pH following HS1 had been previously undetected at this location. 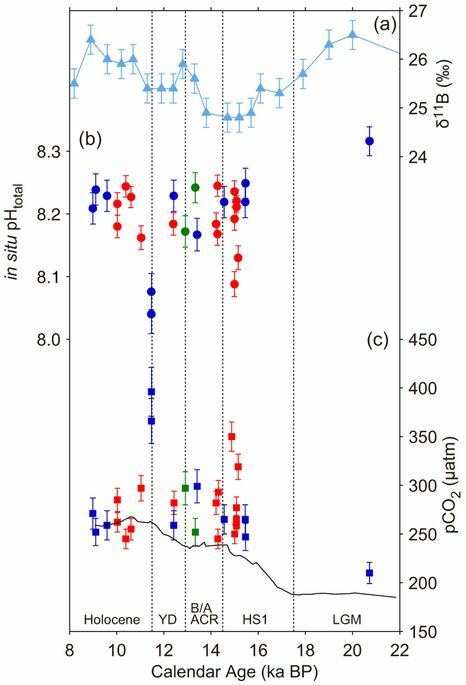 Calculation of pCO2 (see Methods) reveals deglacial values significantly above those of the atmosphere (Figs. 3c and 4a). Conversely, ΔpCO2during last glacial and the early Holocene was nearly zero, suggesting air-sea CO2 equilibrium. …Periods of anomalously low pH and high pCO2 near the transitions from Heinrich Stadial 1 (8.08-8.15 & 300-350 μatm) to the Bølling/Allerød, during the Bølling/Allerød interstadial (8.15-8.20 & >300 μatm) and at the onset of the Holocene (8.02-8.10 & 350-420 μatm). Oddly enough, Steinthorsdottir et al., 2013 also found evidence of anomalously high atmospheric CO2 levels during Bølling/Allerød interstadial and the onset of the Holocene. A new stomatal proxy-based record of CO2 concentrations ([CO2]), based on Betula nana (dwarf birch) leaves from the Hässeldala Port sedimentary sequence in south-eastern Sweden, is presented. The record is of high chronological resolution and spans most of Greenland Interstadial 1 (GI-1a to 1c, Allerød pollen zone), Greenland Stadial 1 (GS-1, Younger Dryas pollen zone) and the very beginning of the Holocene (Preboreal pollen zone). 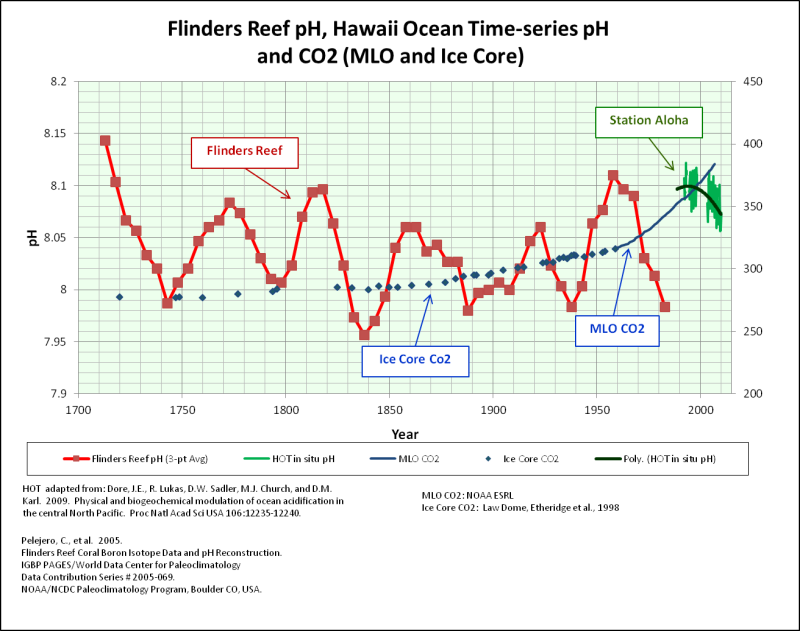 The record clearly demonstrates that i) [CO2] were significantly higher than usually reported for the Last Termination and ii) the overall pattern of CO2 evolution through the studied time period is fairly dynamic, with significant abrupt fluctuations in [CO2] when the climate moved from interstadial to stadial state and vice versa. A new loss-on-ignition chemical record (used here as a proxy for temperature) lends independent support to the Hässeldala Port [CO2] record. The large-amplitude fluctuations around the climate change transitions may indicate unstable climates and that “tipping point” situations were involved in Last Termination climate evolution. The scenario presented here is in contrast to [CO2] records reconstructed from air bubbles trapped in ice, which indicate lower concentrations and a gradual, linear increase of [CO2] through time. The prevalent explanation for the main climate forcer during the Last Termination being ocean circulation patterns needs to re-examined, and a larger role for atmospheric [CO2] considered. Although records of atmospheric [CO2] as obtained from air bubbles in ice cores provide a good overall picture of the [CO2] conditions during approximately the past 800,000 years of the last ice age (Shackleton et al., 2000; Monnin et al., 2001), these records do not typically record short-term oscillations (<200 years), due to smoothing effects caused by both diffusion of gasses within the ice and time-averaging of ice core records (Shackleton et al., 2000; Siegenthaler et al., 2005). However, large short-term oscillations of [CO2] may be extremely important in the climate system, as so-called tipping points may be reached rapidly, causing severe changes in steady state climate (Broecker, 1997, 2006). Setting aside the blather about “tipping points” and “a larger role for atmospheric [CO2]” as a climate “forcer,” Steinthorsdottir et al., 2013 demonstrates sharp rises in atmospheric CO2 near the end of the Bølling/Allerød interstadial (400-450 ppm) and at the onset of the Holocene (>300 ppm). Just about every method of estimating pre-industrial Late Quaternary CO2 levels apart from Antarctic ice cores shows much larger magnitudes and ranges of CO2 concentrations with far more dynamic CO2 development through time… because they are all higher resolution measurements than 99% of Antarctic ice cores For that matter, the magnitude, range and dynamism of Antarctic ice core CO2 varies with resolution. Most of the Gorebal Warming mythology is the result of the correlation of low resolution Antarctic ice cores to higher resolution temperature measurements and proxies. All other factors are never held equal. Proc Natl Acad Sci USA 106:12235–12240. Friedman, G.M. and Sanders, J.E. (1978) “Principles of Sedimentology”. Wiley, New York. Kerrison, Phil & Hall-Spencer, Jason & Suggett, David & Hepburn, Leanne & Steinke, Michael. (2011). “Assessment of pH variability at a coastal CO2 vent for ocean acidification studies.” Estuarine and Coastal Marine Science. 94. 129-137. 10.1016/j.ecss.2011.05.025. Kubota K., Yokoyama Y., Ishikawa T., Obrochta S., Suzuki A. “Larger CO2 source at the equatorial Pacific during the last deglaciation.” (2014) Scientific Reports, 4 , art. no. 5261. Steinthorsdottir, Margret & Wohlfarth, Barbara & Kylander, Malin & Blaauw, Maarten & Reimer, Paula. (2013). “Stomatal proxy record of CO2 concentrations from the last termination suggests an important role for CO2 at climate change transitions.” Quaternary Science Reviews. 68. 43-58. 10.1016/j.quascirev.2013.02.003. Sverdrup, H. U. M. W., Johnson and R. H. Fleming, “The Oceans—Their Physics, Chemistry, and General Biology,” Prentice-Hall, Upper Saddle River, 1942. Wei, G., McCulloch, M.T., Mortimer, G., Deng, W. and Xie, L. 2009. “Evidence for ocean acidification in the Great Barrier Reef of Australia.” Geochimica et Cosmochimica Acta 73: 2332-2346. Zeebe, Richard E. and Wolf-Gladrow, Dieter A. Nice guest post. Same conclusions using different reasoning and facts, in essays Psuedoprecision and Shell Games. In my high school chemistry class, we learned that when a solution moves toward neutral pH (7.0), the process was called “neutralization” … shocker, huh? I have wondered the impact fish, and other inhabitants of the ocean (or above), have on this process. Is poo acidic? Just sayin ….. The various sea animals secrete a chemical that protects them from the alkaline ocean around them. Some of this chemical disolves in the ocean and is what gives the seashore it’s characteristic smell. That is because you did titrations of strong acid vs alkali. With buffered solutions, pH 7 has no special status. What counts is the neutral point of the buffer. We also did weak acid weak base in first year chem to see the difference. And it is different. Here, from here, is the titration curve of NaOH and acetic acid. Note the equivalence point, with equal moles of each, and equivalent to pH 7 in a regular titration. But it is at about pH 9. One of the very few scientifically literate minds on this mainly conspiracy theory blog. I just love it when trolls declare that it’s only science, when it agrees with them. Nick Stokes is correct, but so what? He doesn’t make a point of any substance. It’s not even interesting. What should be interesting to the ‘ocean acidifiers’ is that not even their worst predictions would have the oceans becoming as “acidic” as the internal pH of living organisms. They have to protect themselves from the alkalinity of the ocean, not the acidity. Your endorsement of Nick, and implicitly his interpretation of the titration graph, reflects poorly on your understanding of chemistry. Ethanoic acid. Also known as vinegar. Add a bit of oil, salt, pepper and mustard, shake well and poor over your salads. Nick, you are misinterpreting the titration graph. What it is showing is that significant additions of acid are so strongly buffered that there is only three or four units of pH change until all the buffer is used up. Then, there is an abrupt change in pH from about 11 (alkaline) to about 6 (acidic). 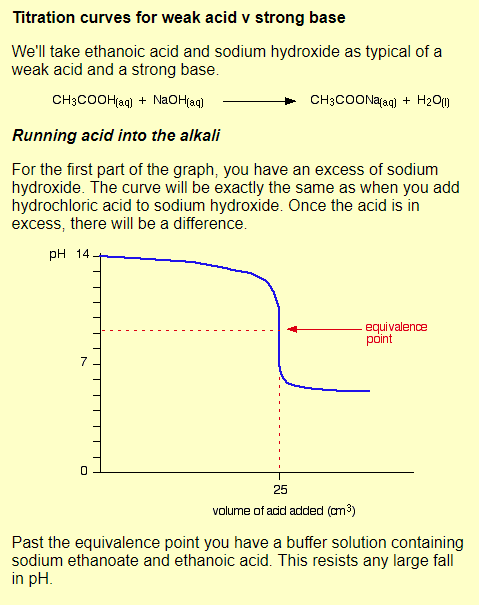 The addition of 25 ml of acid doesn’t define the “neutrality of the solution, it defines the point at which the alkaline buffer is exhausted and the solution assumes a new stability value of about pH 5. You really have a poor grasp of pH and buffering! I’m not sure what it is that I said that you think is a misunderstanding. I didn’t say the equivalence point was the neutral point of the buffer – just that it is different to a regular strong acid/strong base titration, where the equivalence point is pH 7. But I think you have it wrong. The buffer is not on the alkaline side, where much OH⁻ is still present, but on the acid side, where the predominant entities are acetate and acetic. The mid-point of that (neutral point) is the pKa of acetic, which is from memory around 4.7. That’s where [HAc] and [Ac⁻] are equal. Nick, your remarks at 8:22 pm about the neutral point of the carbonate/bicarbonate equilibrium diagram were still fresh in my mind and I thought that your titration graph was another way of trying to prove that a buffered solution has a different neutrality point than an unbuffered solution. Indeed, you say, “Note the equivalence point, with equal moles of each, and equivalent to pH 7 in a regular titration. But it is at about pH 9.” It isn’t the concentration of the chemical species that is important for determining pH, but rather the relative concentration of the hydronium and hydroxyl ions that is the DEFINITION of pH. What you have shown is two species reacting in stoichiometric proportions to use up all the available reactants. The end-product(s) may have an inherent imbalance in hydronium and hydroxyl ions (because of hydrolysis? ), giving rise to a pH that is not 7. But, that doesn’t change the basic definition! Your example simply presents a chemical reaction that proceeds to completion and ends up with an acidic pH. So, to return to sea water, I still say that your remark that “And even at pH 8.1, that is well on the acid side of neutral.” is wrong. See my post to Mickey & Frank at 12:23 June 8th. I’m interested in this equilibrium chemistry, so I do go on about it. I made a active gadget here to illustrate. Usually something stays near constant in the reactions, total dissolved carbon or total alkalinity, so there is basically one degree of freedom, and adding a reagent like CO₂ makes everything else jump into place, which can be seen in the Bjerrum plot. That includes H⁺; as Gunga Din said below, it basically has to fit in with the more abundant species and their reactions. And those species determine the appropriate concept of neutrality. Let me see if I can succinctly state the issue. David, Kip, myself and others object to the use of terms like “more acidic” and “ocean acidification.” You support the terms because you have previously claimed that all solutions are acidic and, most recently, are claiming that a pH of 7 is not special. However, any text you will read on chemistry will point out that the pH scale is divided into an acidic half and a basic half; the intermediate point is defined as “neutral.” It has a pH of 7, because that implies equal quantities of hydronium and hydroxyl, based on the dissociation constant of water. It is basically an issue of definition! You have raised the claim that the “equivalence point” is the true “neutralization,” determined by titrating a buffered solution. You point out that the “equivalence point” can be, and often is, at some pH other than 7. Now, here’s the thing. The “equivalence point” is the stochiometric reaction of the species being titrated. One ends up with a different compound than what one started with. Most chemical compounds, with the exception of salts derived from strong acids and bases, are inherently acidic or basic when dissolved in water. That is, they will have a pH other than 7. So, it shouldn’t be a surprise that when titration of a buffered weak-acid is complete, that it has a pH other than 7. That is because the reaction product is acidic or basic, and not neutral. But, that doesn’t change the definition of a neutral solution, which is a solution of equal concentrations of hydronium and hydroxyl ions. That is, a pH of 7! No Nick, what ‘matters’ is if shellfish and corals can produce/precipitate strong carbonate crystaline structures–guess what? They can, and do–no problems at all, just like always. Jeepers, hows about dat! All the rest is anti-science BS and alarmist utter nonsense. @Nick Stokes – you might even be correct, you usually are, but also as usual, so what? Even if all CO2 alleged to have ever been added to the atmosphere by the combustion of fossil fuels were instantly added to the oceans of the world, it would change the pH of the ocean by how much? And even if you calculate that number, would any flora or fauna currently residing in said oceans even notice? They would not, because just as with temperature, they experience a far greater wave-by-wave variation than the number you just calculated. We need not destroy civilization over a difference that makes no difference. The geological and paleontological records clearly show that the hotter the air and the higher its CO2 content, the happier and healthier are sea creatures with calcium carbonate shells. Yep… the Cretaceous is a big fat QED. I need to (c) that! And that goes double for the Carboniferous! At least for the Mississippian. Or was neutralization the process of adjusting to exactly pH 7.0 (neutrality). In truth, when you “neutralized” a strong base with a strong acid, you actually ended up further from neutrality than the ocean is today. Rising CO2 is making the ocean more acidic (lowering the pH) and bringing it closer to neutrality so one might choose either term. As we know from carbonated beverages, if you add enough CO2 you are no longer neutralizing, but you still are acidifying. The problem isn’t the technical scientific meaning of the terms “acidification” or “neutralization”, it is the meaning conveyed to the ordinary public by these terms. Carbonated beverages, such as your favorite brand of cola, are acidic due to the phosphoric acid that is added to them, not due to the CO2 they contain. DJ: My bottle of soda water is acidic. It contains no phosphoric acid. When discussing the pH of mixtures like soda (or even the ocean), pH isn’t a simple function of how much acid you add, it is a function of the ratio of alkalinity (the CaCO3 washed out of land by rivers over billions of years) and acidity (CO2 or phosphoric acid) and the pKa’s of H2CO3. Colas likely contain both alkaline and acidic (phosphoric acid and CO2) ingredients. It is probably a mistake to suggest that C)2 plays no role in the acidity of colas. Sure, pH 8.2 is to 8.1 is acidification, just like 50 C to 49 C is freezing, and -40 F to -39 F is boiling. No. 50 C to 49 C is cooling, and -40 F to -39 F is warming. Well, isn’t it? How warm does it have to get before you can say that it is warming? Chuck: Sure, pH 8.2 is to 8.1 is acidification, just like 50 C to 49 C is freezing, and -40 F to -39 F is boiling. Wonderful! A perfect example of how confirmation bias causes us to any reject information that doesn’t agree with our deeply held biases. In an attempt to reject the possibility that a reduction in ocean pH from 8.2 to 8.1 could properly be technically described as “acidification”, Chuck has managed to assign new meanings to the terms freezing and boiling. Today’s media and internet is filled with propaganda designed to reinforce our prejudices so that we can’t assimilate new information. Trump, of course, is an expert at this – promoting birtherism to make our Obama seem foreign. Black Lives Matter promotes the myth that racial animus is a major factor the use of lethal force by police. In the classic treatise, Introduction to Geochemistry, (Krauskopf, 1967), he states, “The reaction between an acid and a base, called ‘neutralization,’ is illustrated in its simplest form when dilute solutions of HCl and NaOH are mixed:…” [p.33] He shows a reversible reaction that is stoichiometrically balanced, with no excess, i.e. all components react leaving no unbalanced charges. As with the old question about whether a glass is half-empty or half-full, I would suggest that the activity immediately prior to observation is the key to the answer. That is, if acid is being added to an alkaline solution, the pH is moving in the direction of neutrality. If acid is added to a neutral solution, it becomes acidic, and additional acid will make it “more acidic.” Any purposeful use other than that is sophistry at best, and probably propaganda at worst. Continuing, he remarks, “Strictly, then there is no really correct chemical definition of acid that is simple enough for everyday use. Fortunately, despite their apparent differences, the various definitions give consistent and not very different interpretations of most common reactions. We can choose, therefore, the formulation that is most convenient for geologic purposes, realizing that it is not strictly accurate, but knowing that the inaccuracy is of too low an order to affect geologic predictions. So we pick the simplest representation, the type of reaction favored by Arrhenius…; we define an acid as a substance containing hydrogen which give free hydrogen when dissolved in water, and we describe the characteristic properties of acids as the properties of hydrogen ion.” [p. 30] Implicit in this definition is that the concentration of hydrogen (or hydronium) ions is greater than the hydroxyl ions. That is, ONLY solutions with a pH less than 7 are acidic. He further remarks with respect to buffering, “The pH of ocean water sampled near the surface is almost always between the narrow limits of 8.1 and 8.3 Locally and temporarily it may deviate from this range, but by and large the pH stays surprisingly constant.” [p. 55] Note that prior to 1967 it had been observed that the oceans varied within the range claimed both for pre-industrial estimates and modern measurements. Therefore, it is questionable whether or not there have been any unusual changes in the alkalinity. In summary, alarmists have decided to adopt a new definition of acidity that is not in agreement with the historical precedent used for hundreds of years. One should ask why they felt a need to change the pH scale to one where everything is acidic and any increase in hydronium ions is considered to result in “more acidic” water. Bingo! Thanks a great deal for that. The funny thing is that there were at least two phrases to describe the process prior to the fabrication of “ocean acidification” in 2003. From a general chemistry perspective, there was “neutralization.” Unlike temperature, pH has a neutral state. Since pH is a non-conservative quantity (it varies with temperature, pressure, salinity and orher variables, it isn’t even a particularly useful metric. Dissolved inorganic carbon (DIC, TIC or ∑CO2) and total alkalinity (TA) are the pertinent metrics. The most pertinent metric is the effect all of this has on the CaCO3 saturation state (Ωarg, Ωcal) of seawater. This will be the subject of the sequel to this thread. pH has a neutral state in pure water. That works for solutions that to not act as acid or alkali, eg NaCl. But it is a different neutral state in liquid ammonia, for example. And it is different in buffered solutions, where pH 7 has no special status. A test of that is again blood. “Neutral” is not compatible with life. Which makes the phrase “ocean acidification” even less relevant to the actual geochemical process. No, it means that there is no sensible neutral point that you can pin acidification to. It just means adding acid to any kind of environment. Just as there is no special temperature that you can pin heating to. It just means adding heat. You can heat an igloo or a furnace. Which makes the phrase irrelevant… because the only thing that matters is the CaCO3 saturation state. Nick, because blood has to stay in the highly-buffered bicarbonate-plateau region to perform its job of removing CO2 consistently and reliably. A pH of 7 is not in the middle of the range of the plateau and would have a reduced range of reliable buffering. The activity of blood is different from the activity of calcifiers. You are really raising a strawman argument. Of course blood is not the same as calcification. But both need to work in a solubility range of a constituent of a buffer. And there is no reason in either case why pH 7 should be in that range. No, it’s the Bohr effect related to the blood’s affinity for oxygen which counts, not the buffering by bicarbonate (which is optimum at a pH of 6.1). Ocean acidification is only another elephant thrown into the room by alarmists. The purpose is to frighten some more money out of the public. Like global average temperatures, it is impossible to arrive at a true average or to determine what the ideal circumstances might be. Perhaps the earth should be 3 degrees warmer, or the oceans .5 ph more acidic, or CO2 at 1200 ppm. Brilliant. Absolutely brilliant. The low here will be 59 tonight, and the high tomorrow 84. Its a wonder anyone survives. What is a myth is the stuff about pH 7. The concern isn’t about hydrogen ions, which are vary sparse, even at pH 6. The issue, as indeed with blood and acidosis, is the state of the carbonate/bicarbonate buffer, and (in ocean) the availability of carbonate for shell building. And even at pH 8.1, that is well on the acid side of neutral. In fact, carbonate is only about 9%, and any extra CO2 reduces that. Basically, each CO2 molecule added takes out a carbonate, creating bicarb. Shifting from pH 8.1 to 8.0 reduces carbonate from 9.3% to 7.3% (calculator here). Going to pH 7 reduces carbonate to 0.7%. No, no. Lets confect a myth: that “they’ve” made all this up , and ignore the chemistry. Because then we don’t have to talk about the cause. You continue with your sophistry! At pH 7 hydronium and hydroxyl ions are in equal proportion; at pH 6 there is a 10-fold increase in the concentration of hydronium ions. While they may be sparse in an absolute sense, an increase in pH from 7 to 8 means a 10-fold decrease in hydronium ions. Different shell-building organisms have different ranges of optimal pH, but they are able to build shells in sub-optimal pH conditions with the expenditure of more energy. They typically also have mechanisms such as mucous or chitin coverings of their shells to allow them to deal with transient diurnal changes and transient pH changes in upwelling zones. The sea range is shown in blue. The neutral point is at about pH 9, where the bicarb and carb curves cross. At pH 8.1, carbonate is at about 9%, and on a downhill slope, reducing rapidly with extra acid. At pH 7, it is 0.7%, which would be extremely deficient for calcification. Same in blood, where pH 7 will kill you because of inability to convey CO2. Neutrality, defined as an equal number of hydronium and hydroxyl ions, is the dividing point between acidity and alkalinity. The point on the Bjerrum diagram where carbonate and bicarbonate have equal ratios is not the point of neutrality. It is simply the point of equal carbonate and bicarbonate, which occurs in the Basic region of the diagram. This graph does NOT tell the whole story, it is a strawman. As the pH in the ocean drops, the total amount of carbonate species at equilibrium in the oceans actually increase. Thus even though the ratio of CO3– to HCO3- decreases, total actual CO3– increases in the ocean at equilibrium. Easy proof… Add 10 grams of powdered calcium carbonate into a flask. Bubble CO2 into the flask. Guess what happens……… as long as there is solid CaCO3 available to be dissolved, the pH stays above 8 and the actual number of CO3– ions floating around increases as CO2 is added, even though the ratio (as shown in the graph above … does NOT). The oceans have billions of gigatons of carbonate rock that will permanently keep the oceans basic no matter how much CO2 we produce on this planet. Or 10 grams of shellfish. Or add 10 grams of powdered calcium carbonate and 10 grams of live shellfish. Yes, there is generally abundant shells of dead shellfish and forams to supply any needed carbonate. They would be dissolved preferentially because they lack any protective coverings produced by living organisms. Yep. When shellfish, foram’s and other “bugs” die, their tests/shells eventually get recycled. More CO2 speeds up the recycling process. But as CO2 is gradually added, the pH won’t budge below 8.0 until the buffer is exhausted. And there’s a crapload (mega-giga tonnes) of calcium carbonate on the continental shelves around the world. And then there’s the vast basalt floors of the benthic ocean buffering all that high concentration CO2 in the deep. Life still flourishes. joelobryan: Precisely. When atmospheric CO2 increases, the position of the carbonate/bicarbonate/carbonic acid equilibrium shifts very slightly to maintain the hydronium ion concentration constant. Nick Stokes clearly doesn’t understand how buffers work. In any case, there are plenty of bivalves which live perfectly happily in neutral or even slightly acidic fresh water (freshwater mussels). How does Nick Stokes explain that? I think you don’t understand how they work. They aren’t trying to maintain anything constant. If you look at the Bjerrum plot I showed above, you’ll see that in the sea region and lower pH, the slope of the black [CO₃⁻²] line is close to 1. That isn’t a coincidence. It comes from the Law of Mass Action and the equations. [CO₃⁻²] and [H⁺] change in near inverse proportion (because [HCO₃⁻] stays fairly constant, being in excess). The buffering happens because there is a lot more [CO₃⁻²] than [H⁺], so you can add a quantum of acid which reacts with CO₃⁻² but makes a small change in [CO₃⁻²], reacting mole for mole, and so the same proportional change in [H⁺]. Nick, you said, “The buffering happens because there is a lot more [CO₃⁻²] than [H⁺],…” In other words, the solution is deficient in hydronium ions and is therefore alkaline. Showing your lack of chemical knowledge again. The product [H+][OH-]=10^-14 in water, seawater at pH 8 has 10^-8 moles/l of H+ and therefore 10^-6 moles/l of OH-. [CO3–] on the other hand is ~ 10^-3.5 moles/l, so orders of magnitude greater than [H+] which doesn’t indicate that it’s alkaline. At pH 7 [CO3–] will be about 10^-4.5 compared with [H+} at 10^-7. The definition of pH is based on the relationship between hydronium and hydroxyl ions, not on carbonate. So we agree that a significant increase in [CO2] results in only a very small increase in [H3O+]? A factor of ten increase in [CO2] results in approximately a factor of ten increase in [H+]. Like Nick Stokes, you have no understanding of buffers. A ten-fold increase in [CO2] causes the position of the carbonate/bicarbonate/carbonic acid equilibrium to shift slightly, resulting in only a very small increase in [H+}. At pH 8 CO2 is ~10^-5 mol/kg, at pH 7 CO2 is ~10^-4. Nick Stokes: perhaps you could address my point about the existence of bivalves in neutral or even acidic fresh water. Not only that, plenty of fossilized bivalves from eras where CO2 concentration in the atmosphere was higher than today. Life flourished then and will continue to today. Pls stick to the facts. In a healthy body blood pH is carefully maintained between 7.35 and 7.45. And if it goes below, the condition is called acidosis, and is bad. If it gets to “neutral”, you die. And yet a person can drink vinegar, or lemon juice, or have a stomach which is naturally always full of strong hydrochloric acid, and yet never ever go into a state of acidosis. Because living organisms have homeostatic mechanisms that have long since given every organism to easily survive and thrive under a wide range of conditions. I sure am glad I do not live inside such a confused and clueless mind. Indeed so. They are promptly metabolised (citric acid cycle, acetyl-CoA and all that). If you want to induce acidosis, you need something else. Here is the great physiologist Haldane describing how he induced acidosis in himself by eating ammonium chloride. It was not fun. The lowest pH was 7.2. What’s your point on this? You are not a haematologist, I know more about blood than you since I was diagnosed with hemochromatosis. You really should stop posting rubbish you don’t understand. THAT HOT AIR because it’s about 4% CO2 ! Good Grief ! HOW DOES HE SURVIVE !??? The caps really make you look childish. Nick, once again, misrepresents a descriptive word as vague proof that a condition, in this case “acidic”, is proven by use of the word. Which ignores that somebody used that descriptive solely as an illustrative title, not a scientific proof. I. Blood Bicarbonate and Acidosis. that it automatically converts into bicarbonate all bases not bound by other acids. The bicarbonate therefore represents the excess of base which is left after all the non-volatile acids have been neutralized and is available for the immediate neutralization of further acids. In this sense it constitutes the alkaline reserve of the body. The bicarbonate concentration of the blood is representative of that of the body fluids in general, and is normally maintained at a definite level. Acidosis does not mean the blood is acidic, ever. Acidification does not imply that the ocean is acidic, ever! They establish the blood bicarbonate as a criterion of the acid-base balance of the body. Accordingly, for use in the present series of papers, we define acidosis as a condition in which the concentration of bicarbonate in the blood is reduced below the normal level. The definition appears a necessary preliminary because of present confusion in the literature, different authors regarding acidosis differently as (’ acid intoxication,” as a condition in which acetone bodies are formed, or as an actual increase in the hydrogen ion concentration of the blood. OK if you are willing to say distilled water is orders of magnitude more acidic than ocean water. Then even the non chemist will get your scam. Ferdinand, your last sentence claims “…huge algal blooms make the oceans more acidic…” I take issue with “more acidic.” The article that you provided a link to assiduously uses the term alkaline, NOT acidic. If you are suggesting that the CO2 released by the coccolithophores results in increased carbonic acid, the you would seem to be ignoring the buffering action of the carbonate/bicarbonate system. Do you have any citations for measurement of pH in the blooms? Ferdinand, your last sentence claims “…huge algal blooms make the oceans more acidic…” I take issue with “more acidic.” The article that you provided a link to assiduously uses the term alkaline, NOT acidic. It doesn’t use the term ‘alkaline’ at all! If you are suggesting that the CO2 released by the coccolithophores results in increased carbonic acid, the you would seem to be ignoring the buffering action of the carbonate/bicarbonate system. “The removal of 2 HCO3 molecules and the addition of one CO2 molecule changes the alkalinity and this indirectly causes more of the dissolved carbon to be pushed into the CO2 form. Although the total dissolved carbon is obviously reduced by removal of dissolved carbon (bicarbonate ions) into solid calcium carbonate, yet the total effect, paradoxically, is to produce more dissolved CO2 in the water. That’s a matter of mechanism for that case. But in terms of unfavorable equilibrium, it comes to the same thing. Low pH inhibits uptake of carbonate by scarcity of reagent. In the reaction you describe, it inhibits equally by excess of product CO₂. In this, Ca⁺⁺, H₂O and CaCO₃ (solid) will not vary in concentration. Nor will bicarb, in ratio, because it already represents about 90% of DIC. The only thing in the equation that varies is CO₂, and that inhibits the reaction. These are equilibrium, mass action arguments, and are indifferent to mechanism; only affected by stoichiometry. The pH at which 2 compounds are in equilibrium does not change how the pH scale works. It does not make it acidfication, alkalinization or neutralization. It just means that the equilibrium of those 2 compounds falls within that pH range. It doesn’t mean that anything outside that is good/bad/neutral or that we should have no concerns for the changes that can be made, but just that the pH is lower. We should look to see what will happen if the pH drops by 0.2 or whatever is within true possibilities, not a pH of 7 planet-wide that likely will never happen from the A part of CAGW. This entire article talks about how acidification was used to scare people. I’m not too keen on putting my body in acid nor other living creatures in acid. It’s not like I would want to stick my hand in an especially strong alkali eithe, but people know and fear ACID. I am coining the phrase, lowering the pH-ification, to appease both sides. Nick and I don’t disagree by wide margins on many topics. Nick, the term you are looking for is half-equivalence point, where the two species are at equal concentration, identified by the intersection of the two concentrations. Even in a buffered solution, the point of equal abundance of hydronium and hydroxyl ions is pH 7. What is important biologically is the availability of carbonate ions for shell building. If you look at the Bjerrum plot for which I provided a Wikipedia link, you see the equilibrium curves for the important carbonate/bicarbonate species. Konrad Krauskopf has stated that sea water has a lower limit of pH above 7. Thus, shell building organisms won’t run out of carbonate even under the worst-case scenario. Inasmuch as this is an equilibrium diagram of a buffered solution, removing some carbonate for shell building will allow some of the bicarbonate to be converted to carbonate to replace the extracted carbonate. That is, not only is the pH buffered, but the species in the buffered solution resist change such as to retain a constant ratio. Here’s what’s never mentioned: While CO2 is very soluble in water, its solubility is highly dependent on temperature. Cold water can hold much, much more CO2 than warm water. So as the earth cools during ice ages, tremendous amounts of CO2 get sucked out of the atmosphere and dissolved into the oceans. But as an ice age ends, (like right now), as the oceans warm, they release that tremendous amount of dissolved CO2 back into the atmosphere. The dissolved CO2 in the cold oceans has to come back out because warm water simply can’t hold as much CO2 in solution as cold water. The increase of CO2 in our atmosphere that we are currently observing (from 350 parts per million to 400 parts per million) is due in some part to dissolved CO2 being released back into the atmosphere by the warming oceans. Humans are obviously contributing to this increase in CO2 by burning fossil fuels, making concrete, etc., but the amount of CO2 released to our atmosphere by the oceans vs. contributed by human activities is unknown. So to recap, at the end of every ice age as the earth warms, the levels of atmospheric CO2 MUST increase, because the laws of physics demand it. As the oceans warm, they MUST release their dissolved CO2 back into the atmosphere simply because warm water can’t contain as much dissolved CO2 as cold water. The idea that warming oceans that are already supersaturated with CO2 can somehow absorb more CO2 from the atmosphere and becoming acidic is complete nonsense. I have repeatedly conducted this critical experiment with beer, but for some reason, NOAA won’t grant me a grant to follow through on my CO2 observations. We’re desperately in need of grant money to study the influence of carbonated beverages on atmospheric carbon levels. It’s known as Henry’s Law, look it up. The oceans are not supersaturated. The more mono-carbonate is reduced, the more will be dissolved from the ocean floor. It’s impossible for oceans to go to “pH 7”. There’s not enough fossil fuel on the planet to make that much CO2, to make a significant difference. Shelly sea creatures have survived for hundreds of millions of years during which Earth was much hotter and CO2 much higher than now. Shelly sea creatures evolved in the Cambrian, when Earth’s air was enriched with CO2 to the tune of 7000 ppm and temperature averaged seven degrees C higher than now, and was hotter than that for much of the period. The heavily armored shells of the ubiquitous trilobites, for instance, were reinforced by calcium carbonate (CaCO3). This substance fossilized far more easily than the fragile exoskeletons of other arthropods, made of chitin, a sugar derivative. Thus, trilobites left numerous preserved remains, leading to the false impression that they were the dominant arthropods, the Cambrian animal group most numerous in the ocean then, as indeed they are today on land and sea. But in fact, trilobites were only a minor part of arthropod diversity. At the same time, the mollusk shell was evolving. The edge of the mollusk mantle secretes a shell which consists mainly of chitin and conchiolin (a protein hardened with calcium carbonate), except the outermost layer, which in most cases is pure conchiolin. While most mollusk shells are composed mainly of aragonite (one of the two main forms of calcium carbonate), those gastropods that lay eggs with a hard shell use calcite (sometimes with traces of aragonite) to construct the eggshells. The shell consists of three layers: the outer layer (periostracum) made of organic matter, a middle layer made of columnar calcite, and an inner layer composed of laminated calcite, often nacreous (containing mother-of-pearl). So the hotter and higher the CO2 level, the better for calcium carbonate-dependent sea creatures. They like it hot and high, the better to recreate the environment in which their ancestors evolved. Are you suggesting that the “shelly sea creatures” evolved, then stopped evolving for hundreds of millions of years? Presumably their evolution tracks conditions to maximize their physiological efficiency at a particular (contemporary) pH and temperature range. The problem is when conditions change too quickly for evolution to keep up. It may well be that at least some of the critters will be able to adapt and survive as a species, but that depends on a whole lotta factors. The pH is changing measurably over the course of decades rather centuries or millennia, and will continue to decrease as the atmospheric CO2 increases. Looking forever to the past to try to understand the effects of present and future climate change is bound to lead to erroneous conclusions. The past is not like today; we can only fully understand climate and climate change by taking into account human effects, not just in terms of GHG, but also land use. For instance, conversion of forest to agriculture has changed the sources and sinks of GHG. And we can only imagine the potential effects by keeping in mind that the rate of change is unprecedented, and there is bound to be a lag time before some changes are noticed, then another before they are demonstrated scientifically. I’m not suggesting that evolution has stopped. My point is that Earth was much hotter, with much higher CO2 when calcium carbonate-shelled sea creatures first evolved. They have survived 540 million years of climate change, often rapid, without succumbing to all that has been thrown at them. Nothing is happening rapidly enough now for sea creatures not to be able to adapt. Temperature change has been much more rapid in the past. Sea creature generations are short. They evolve rapidly when conditions change. Climate change today is as nothing compared to climate change of the past. Present historically abysmally low CO2 air levels are a threat to all life on Earth. Atmospheric CO2 levels three times higher than now would be ideal for land plants and all life which depends upon them. Yeah, I can hear the trees gasping for air. Poor things. If shelled organisms are so good at adapting, why not plants? Uh Kristi… how well do you think you would adapt to complete lack of food?? No CO2, no plants… period. Felix’s idea is that marine organisms can adapt to changes. I’m saying, if they can adapt, why can’t plants adapt to low CO2? I’m not talking about no CO2, but what about 140 ppm, for example? (In any case, the amount now is certainly not at threat to all life on Earth!”) People assume that because present-day plants die at a certain CO2 threshold, they could never adapt to live at lower levels. Why? Many have the idea that present-day marine organisms will simply evolve to survive in a changing environment. I think that is probably true of many or most species, but not necessarily all of them. Just as plants have limits to physiological adaptation, some species of shelled marine organisms might not have the capacity to adapt, or do so quickly enough. Populations that get stressed by pH and temperature could also be more susceptible to disease and water quality (e.g. turbidity and siltation), storms, high predator populations, etc. Many marine calcifers don’t eat and breath CO2. True enough. I’d even go so far as to say none of them do. So what? Marine calcifers that make use of photosynthesis eat and/or breathe CO2. James Hutton famously said “The present is the key to the past.” It is fair to say that the inverse is true. You said, “The pH is changing measurably over the course of decades rather centuries or millennia, and will continue to decrease as the atmospheric CO2 increases.” First of all, temporal resolution is inversely proportional to the time from the present. We don’t really know if the changes are any greater today than in the past. As it is, the claimed recent change is based on — wait for it — a computer model. The historical records of ocean pH have been dismissed as unreliable by modern climatologists (but temperatures are OK!). Therefore, sparse modern measurements have been compared to an unverified model to estimate the recent change. According to Konrad Krauskopf, there is a lower limit on pH above 7, and because of buffering, will not decrease in direct proportion to the increase in atmospheric CO2. Felix, you must keep in mind that warmistas are in a state of complete ignorance regarding the adaptability and resilience of living organisms. This is because they have some mysterious and desperate NEED for disaster to be imminent, which is so powerful and pervasive in their psyche that when the disasters, which they assure themselves and everyone else are just around the corner, fail to materialize, not a single one of them has ever once expressed the emotion of relief at having their worst fears proven wrong. They refuse to believe they were ever wrong, no mater how many times it happens, cannot even debate all of the past wrongnesses…they simply put them out of their minds as if they never occurred and move onto the next imagined disaster scenario, while passing them along to their warmista brethren who breathlessly parrot the latest assurances of doom as if everyone who was not born knowing them wants to torture their own children to death in at atmospheric oven. It is truly a mental illness that everyone can see but those infected. The mechanism is well known…cognitive dissonance. They are literally incapable of seeing the truth if it contradicts what they want to believe. Frankly, I think it’s more because they ‘believe’ in both a pre-human ‘unspoilt’ optimal bio-Paradise state, and also in ‘Conservation’. Both without realising that these two seemingly real ‘things’ (they project) have never existed any more than a static climate has ever existed (paleontology makes acutely clear none of those three ideological ideals have ever existed. In other words, everything underlaying their idealistic waffle about “restoring the Earth” and its alleged “natural balance” of ‘conserved’ species, is not only misguided, it’s quite physically impossible to occur, and can never exist on this planet. The story of paleontology is one of continual extinctions of species and emergence of plethora of new ones, that thrive on biota and enviromental disturbance! And every one of the extinctione made no impairing difference to life on earth. Life just adjusted to every change—every time. Net nothing lost and nothing gained, just unrelenting uncontrollable self-moderating change, and no signs whatsoever of a ‘natural paradise’ state, nor any sign if “conservation” of species. Conservation is antithetical to a healthy biota, which instead thrives with the challenge of global change. Those are just FALSE human (anthropocentric) notions, dumb ideals, that are well out of step with ‘nature’, and the planet that we observe. I have a Master’s in ecology and evolution. But it’s a moot point because you can’t be talking about me, anyway. You’re talking about a fantasy. I somehow doubt atmospheric CO2 at 400ppm will make the slightest difference to the alkalinity of the worlds oceans. Seems to me you have consigned Michael Mann’s hockey stick theory to irrelevance. You’ll be ex communicated from the climate alarmist faithful. I don’t give a dam what climate alarmists think. I think for myself. The hockey stick says nothing about effects of past, present or future climate change. The temp is the measure of climate change. The point is, it makes a difference to the acidity, not the alkalinity. But I know what you mean. Apparently my links are present, but just not showing. Move your cursor over the areas after the colons and when the cursor changes to a hand, click the left button on your mouse to go to the link(s). What I found is if you replace the http:// with a wwwdot, the link will show up. Indeed so. The point of a buffer is that it stabilizes pH, by transferring the effect to the balance of buffer species. But that balance is the issue here. You can take out a lot of carbonate without shifting pH much. But it’s the loss of carbonate that hurts. So Nick, do some math for us. How much additional, beyond natural, “anthropogenic atmospheric CO2 per year” does it take to move the PH of a 70% oceanic buffered planet over what time scale by .001%? Think about it for a minute, and let us know. Doesn’t make sense. pH is a log. We kind of know the answer to the effect of CO2. It is generally estimated that anthro CO2 has so far reduced the pH from 8.2 to 8.1. That is actually increasing H⁺ by a factor of 1.25. The point is that in this region of the equilibrium, carbonate decreases proportionally, and that is quite a lot. From about 9% of DIC to 7%. Not so bad so far, but we have a lot more carbon we can burn. That estimated reduction is 99% circular reasoning. It’s calculated from atmospheric CO2. Mr. Stokes: “A calculation is what was requested.” But you provided an estimation, not a calculation. 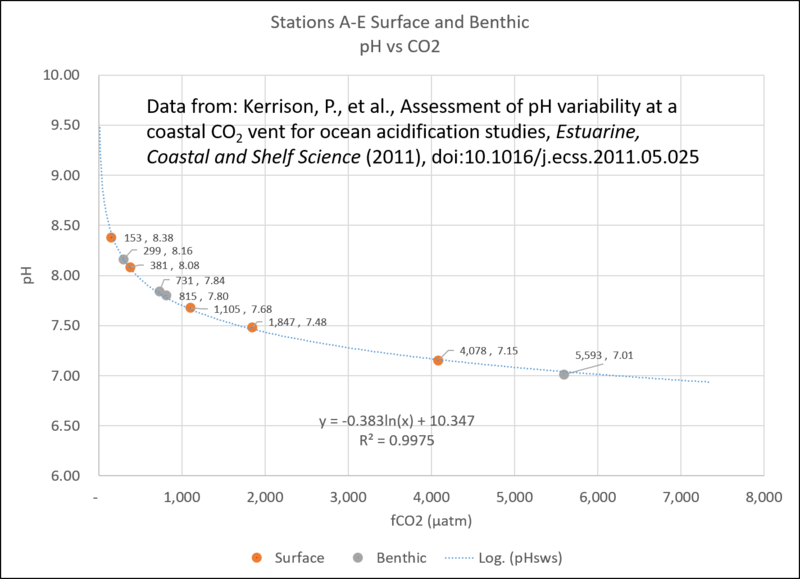 The estimate is based on a calculation of the relationship between atmospheric CO2 and seawater pH. It’s basically a function of a SWAG and Henry’s Law. David: Thus the estimate is not the calculation. And presenting an estimate instead of showing the work, does that serve to obfuscate the circular reasoning behind the estimate? Smells like race horsing, no? The estimate is the result of a calculation. The problem is that the estimated pre-industrial pH is calculated from Antarctic ice core CO2 data. 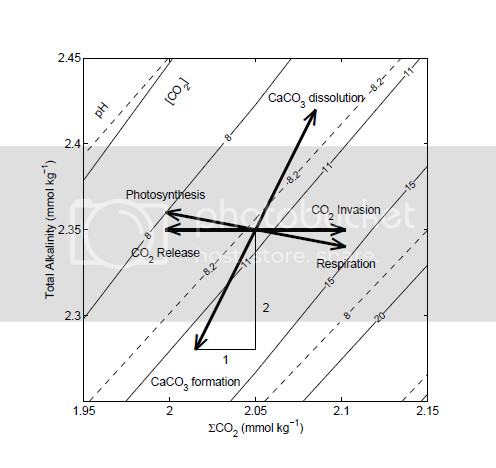 The assumed effect of CO2 on pH is calculated from pH derived from CO2. Excel would call this a circular reference error (slight /sarc). And ignores the concomitant buffering of borate. That is, Nick’s SWAG is an upper-bound of the change. Nick also doesn’t acknowledge that the pH 8.2 value is a calculated estimate, not empirically obtained. According to wiki, total boron is about a fifth of total carbon. A nuisance value, but it won’t change much in the result. And of course, is unaffected by adding CO₂. According to NOAA’s Keeling curve, in 1960 atmospheric CO2 was 317ppm and in 2018 it is 410ppm. That is an increase of 1.00425 per year. If my numbers are correct, CO2 levels will double in 150 years and PH will be reduced to 8.0. No Nick… as CO2 is added to the ocean, it dissolves additional CaCO3 to produce even MORE actual CO3–, not less. Try this… add 10g of CaCO3 to a flask of water. Bubble in enough CO2 to dissolve 1 gram of the CaCO3 powder. Measure the pH, you will get a value very close to 8.25. Bubble in more CO2 such that now 5 grams of CaCO3 has dissolved. Measure the pH again… its barely changed, down maybe to 8.20. 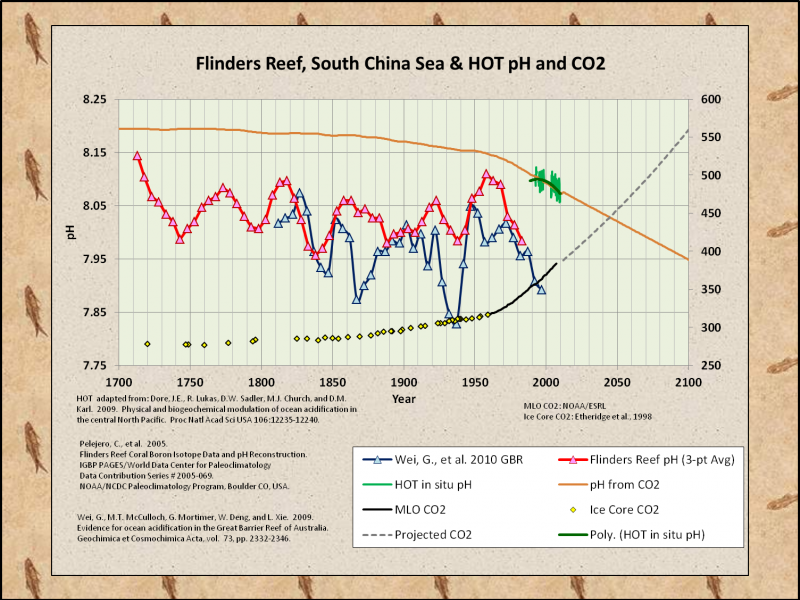 True, the CO3– to HCO3- ratio has decreased per your graph, however total CO3– has actually gone way up! That’s the problem. It depends on where it comes from. If it comes from the critters (or prevents them depositing same) that’s bad. If there is an alternative supply around, OK.
No. Le Chatelier’s principle says that the system adjusts to part counter the change, in this case, by dissolving in response to lower [CO₃⁻²]. It doesn’t prescribe overshoot. Wrong Nick, in your system you are NOT allowing for any new sources of carbonate. That graph ONLY refers to ratios between the different species not total actual numbers. In a system in which there is a fixed, constant total carbon containing ions present it would be true. 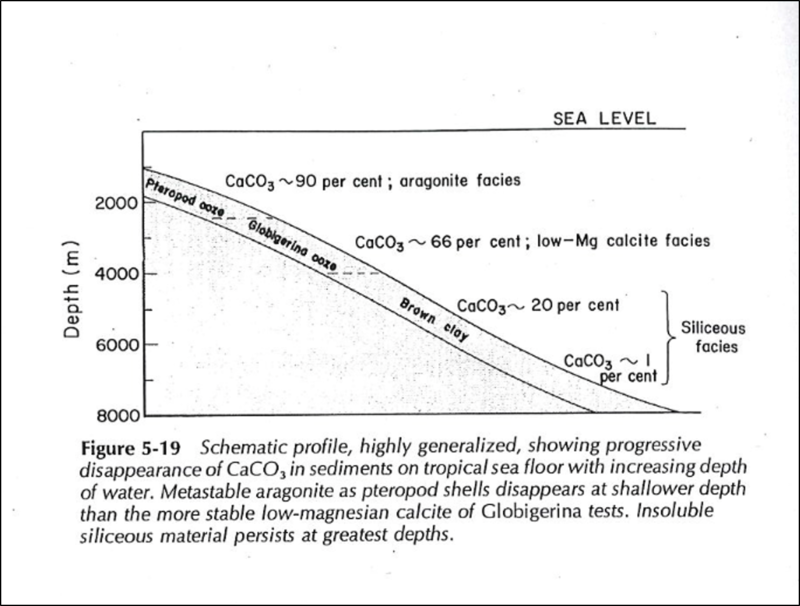 However that is simply NOT the case for the ocean in which there is an unlimited amount of limestone (CaCO3) available. 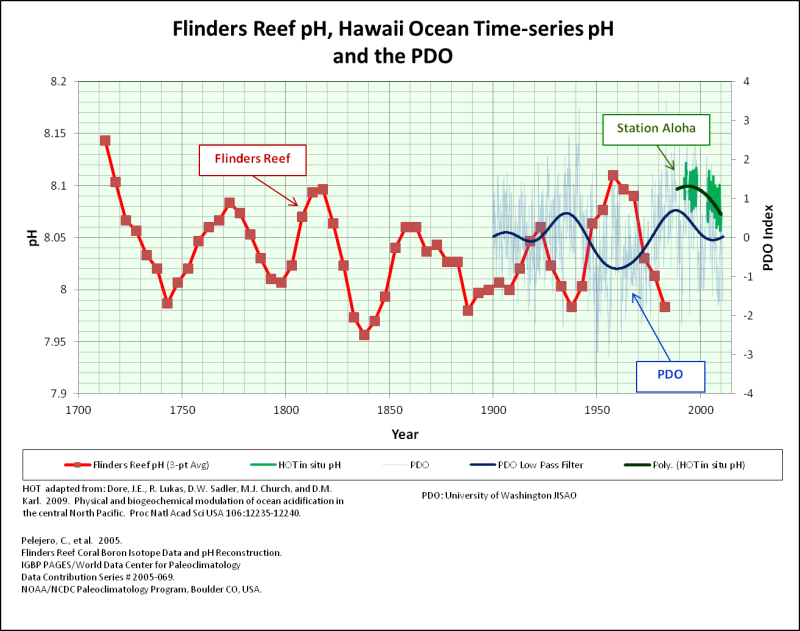 So that graph is a strawman for the ocean…. it does NOT represent the ocean at equilibrium. That is why, even when the atmosphere was 8000 ppm CO2 the oceans were basic, and yet shell fish THRIVED. Well, to take your example of powdered CaCO₃, well mixed, that produces a saturation level of dissolved carbonate, if there is excess Ca⁺⁺, as there is in the ocean. Adding CO₂ can’t increase that. It can only convert CO₃⁻² to HCO₃⁻, which will then cause more CaCO₃, to dissolve and restore saturation. If it went beyond, there would be precipitation. Actually, the system is apt to supersaturate, but that is another story. It is still true that removing CO₃⁻² with acid can’t produce a response that ends up with more than you started with. Nick, why do you conveniently ignore the part about when there was orders of magnitude more CO2 in the air and life was even more bountiful and prosperous, not less, and it was certainly not disastrous or in any way harmful? And why do you ignore the many places where the sea is in fact acidic due to local conditions like say a river emptying into the oceans (or for that matter fresh water ecosystems where the water is acidic and shelled creatures thrive in adundance?) , or where CO2 is far higher due to volcanic activity? Tell me… what does Le Chatelier’s principle say about this?? 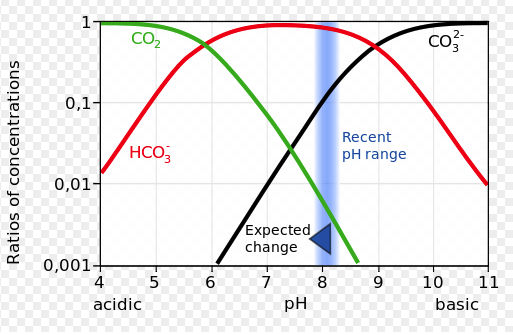 Now as in your graph, the ratio between HCO3- and CO3– is fixed at a constant pH, then what happens to the CO3– as more CO2 is added??? I have been all over this with Stokes. He pretends to have knowledge of chemistry but he does not. The truth is, Stokes knows he is wrong. He has been proven wrong again and again and again, over many years, and keeps repeating the same sophistic nonsense over and over again, as if he had no memory of past identical discussions. His mission here is obvious…he is on the scene to provide the illusion to anyone reading this blog that there is some factual dispute. IOW…he is creating a smokescreen of obfuscation for the benefit of those on the fence about what to believe, or who are hearing this discussion for the first time. In fact, I’m propounding the standard scientific view, as described in, say, Zeebe’s 2012 review. Your version is, well, something else. And while some might hold out hope that it is right, it can hardly be said that it is indisputable. The net result of these shifts in equilibrium concentrations is increased H+(aq) (reduced pH), and decreased availability of CaCO3 and CO3-–(aq). Phil, the carbonate ultimately comes from the carbonate solids, not the free carbonate ion in the sea water. So your final equation is once again bogus. Question… how does one prepare a saturated solution of Ca(HCO3)2? Calcium bicarbonate is not a stable solid at room temperature. Calcium bicarbonate is also soluble in water to an astounding 16g/100ml. Answer: Start with about 10g of powdered CaCO3 solid in 100ml of water. Add 4.4 g of CO2. This will dissolve ALL of the CaCO3 solid resulting in a concentrated Ca(HCO3) solution with absolutely no CaCO3 solid on the bottom of your flask. And what would the pH of this solution be??? You warmists might argue it would be acidic (less than pH 7) by then but wow… it is still above 8, imagine that. Now using your ratios of species versus pH, you will see you will have a VERY high CO3– concentration as well since the ratio is determined by pH. I remembered a post that cited Sverdrup, Johnson & Fleming… But I couldn’t remember the title of the post or the author. I tried to limit this to the derivation of the mythical phrase, “ocean acidification.” I wasn’t ready to pen another 7,400 word post… Which is what would have happened if I did a deep dive into carbonate geochemistry. “The pH of a natural water is not, then, a reliable index of its ability to neutralize strong acids or alkalies.” Page 55 from Warren, C. E. 1971 Biology and Water Pollution Control. W. B. Saunders. The most productive places on earth have the widest fluctuations, often with the lowest pH. I worked once with a clam that lived in or near acid conditions, sometimes buried in a real pH below 7. It thickened its shell, with an organic periostracum. I also have worked where pH was often near 9. Organisms exploit what we now consider toxic. Sverdrup, et al., and many books of the period (pre-roughly 1980), while not up to date, should be read for the sanity of their language. Back away (from your alarmist claims) bit-by-bit in the face of glaring evidence to the contrary whilst continuing to attract funding! What do the Pirates of Pomerania think of this? “Calling this phenomenon ‘ocean acidification’ when surface seawater will remain “basic” under future emissions scenarios is alarmist,” giving the impression this was their position. He did not mention that the section is titled, “Common misconceptions about pH and ocean ‘acidification'” His source is actually saying that David is, indeed, creating a straw man. Very crafty, though, to use that quote! Isn’t it wonderful how we can completely change the meaning of other people’s words by taking them out of context and reinterpreting them? Who cares about truth when rhetoric will get the job done? How convenient to use the science you like and dismiss what you don’t! Now if only climate science behaved this way, there would be no uncertainty. Fortunately, science doesn’t work like that. Reading shouldn’t be so challenging. Reading your mish mash I had the same thoughts as those Kristi expressed. You spoil your work with puerile epithets which shows a bias and ruins your credibility. It’s only fair that I provide the feeble-minded an avenue to participate in the discussion. You trigger easily. It reflects in the poor quality of your work. Have you considered professional help? My narcissism was diagnosed as less than clinical… However, if I didn’t lace my posts with sarcasm, obnoxious puerile epithets and gratuitous pop culture references, we wouldn’t be having this “discussion,” because it afforded you an entry point. For being so easily triggered. That’s all well and good, but it leaves the rest of us out. SP, funny, I had the exact same thoughts reading your “contributions”. funny, I had the exact same thoughts reading your “contributions”. You must be captain of your kindergarten debate team! Odd reaction. Just read all 64 of your comments, epithets, insults and exaggerated conclusions. I read nothing that indicated any of your conclusions are valid, other than you agree with the CGAW consensus; and are viciously argumentative in repeating vague accusations and insults. Thank you for affirming that you have reading and comprehension issues, too! Any thing else that you feel compelled to share? Reading is not at all challenging. Finding the truth is the challenge. Using the word myth in the title is biblical standard irony. His eyes as it had been scales. That the claims of the alarmists are just myth making in actions has been amply demonstrated. That the alarmists don’t want to deal with reality is a problem we will just have to learn to deal with. What is startling Kristi is that you actually expect to be taken seriously while defending/justifying the outrageous imaginary flee-circus of “ocean acidification”, that we’ve all seen play-out, for over a decade, then you claim you’re just being all ‘sciencey’ and ‘proper’. You are obviously another expert obfuscator. Now, how about you try for some scientific expertise instead? Your blather does not work on people who have an actual scientific education. Obfuscation was her minor in college. Kristi, I’m guessing you just have never been taught anything about reading comprehension. When someone puts a word in quotes, it generally means that they are using the word advisedly. Thus David’s quote from the piece is not in contradiction to the title of the piece. If you were half as smart as you think you are, you wouldn’t need me to point this out to you. BTW, just because a climate alarmist claims to be doing science, is not evidence that they are actually doing science. As David and others have amply demonstrated over and over again. The quote was absolutely in context. The only person who took it out of context was the illiterate person who accused me of taking it out of context. The NOAA/PMEL quote was fine in your context. That’s not the problem. The problem is that taking something someone says and twisting it to suit your needs is misrepresenting their words, and that is not good practice if you want any credibility. This is done often enough by skeptics that it has come to taint my image of them and their arguments. That’s too bad, because skeptics do have some good arguments, and I’ve come to see some things differently. 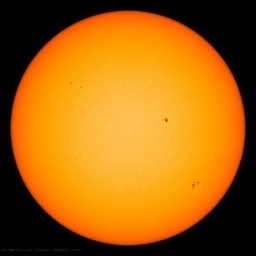 Alarmists’ blatant, shameless lies and trickery don’t taint your image of them? Now there’s a real barn-burner course!! “Principles of Watching Paint Dry” only much, much slower. The video is there, just invisible for now. Not sure what I did wrong. A little help from the mods? Mobile here, just in case it makes a difference…. Got a copy of the same text, it’s not that boring really, ‘Invertebrate Paleontology and Evolution’ (Clarkson) always put me to sleep, never read that one after a snack, you’ll just pass-out. ‘Sedimentology, Process and Product’ (Leeder), was more interesting though. I find invertebrate paleontology interesting. Less so than vertebrate, but still not in the least boring. Over the long, long run of history on planet earth, CO2 levels have at times been much higher than today. And they will be again, naturally. It’s not something to be feared. It should be celebrated! You mean like at the Permian-Triassic transition when CO2 increased by about 2000ppm and ~95% of marine species became extinct (and ~50% of marine genera)? That’s not something to be feared? Phil, you are assuming that the increased CO2 was the cause of warming rather than the result of outgassing from warming seas. I suspect that both processes are active through feedback loops. The extinctions might also have been the result of SO2 and H2S poisoning the marine and terrestrial life. However, the point is, you should probably state your assumptions up front. The data indicate that the CO2 level in the ocean had increased, that could not be the result of warming seas alone. Only possible if there had been a substantial increase in atmospheric CO2 from other sources such as volcanism and extensive associated fires. The extinction primarily impacted those marine organisms with calcium carbonate skeletons, the organisms with the highest survival rates were those that had active control of their circulation, sophisticated gas exchange systems and low calcification. All this indicates that the extinction was the result of a substantial increase in CO2, quite likely the result of massive coal burning caused by basaltic eruptions. My starting assumption is that the laws of chemistry applied in the same way as they do now, something you show your ignorance of in this thread. Geological history beyond the past 5.5My is interest and knowledge but has no bearing on the current situation and conditions. Your hypothesis fails the scientific method! Is it your contention that modern CO2 behaves differently than did CO2 5.5My? If not, why is evidence that CO2 levels much higher than today was good for the planet not relevant to our current situation? Apparently you are ignorant of the very basics of earth science. I don’t waste my time with nescient rookies. The presence of your response contradicts your claim. Are you suggesting there is a causal relationship between CO2 at 2000 ppm and mass extinctions? What happened when the CO2 was 4000 ppm, and 7000 ppm? Extrapolating your suggestion, 4000 ppm would have killed 100% and 7000 would have killed 175% of all life forms. If you find such a projection unreasonable, you will understand how equally unreasonable it is to project the 1976-1997 temperature rise 100 years into the future. Marine organisms with calcium carbonate shells or skeletons weren’t wiped out during intervals before and after the P/T MEE when atmospheric CO2 was even higher. Nor can it be shown that a more rapid rate of change in CO2 levels would cause their extinction. More likely, if the Siberian Traps are the cause at all, is that other volatiles besides CO2 released by them were the culprit, such as CO, H2S and SO2. The “funny” thing is that during the PETM, there is evidence of fairly rapid warming, a possible sharp rise in CO2, and definitive evidence of shoaling of the lysocline (ocean acidification since 2003)… but no associated mass extinction. I guess benthic foraminifera don’t count? Google “mass extinction” and get back to me when you find a mass extinction associated with the PETM. There are plenty, will this one do? 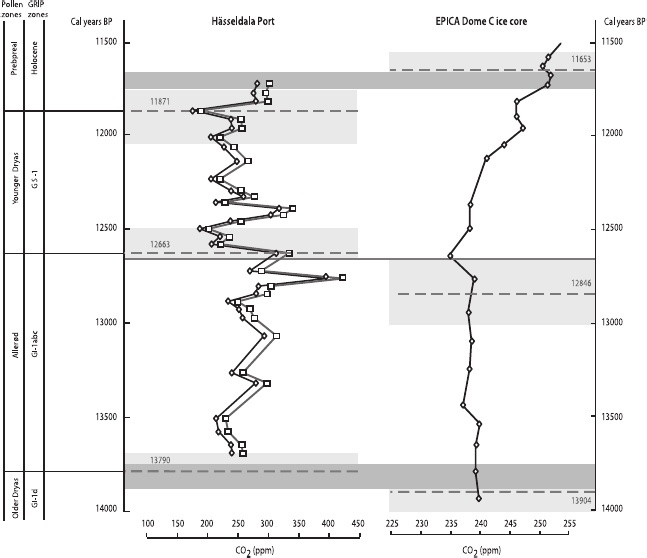 Bathyal benthic foraminifera and stable isotopes from the Caravaca and Zumaya sections of Spain, indicate that the mass extinction near the Paleocene/Eocene (P/E) boundary (upper planktic foraminiferal Zone P6a) was rapid, coinciding with a negative δ13C-shift of 2–4%., the onset of dark grey shale deposition and increased carbonate dissolution……. The PETM extinctions are not classified as a mass extinction event. There have been 5 mass extinctions. It is generally accepted that there were five major episodes of mass extinction in the Phanerozoic record: end-Ordovician, late Devonian (Frasnian-Famennian boundary), end-Permian, end-Triassic and end-Cretaceous. In addition a number of lesser events have been widely recognized, most notably at the Devonian-Carboniferous, Cenomanian-Turonian and Paleocene-Eocene boundaries, and in the early Toarcian. The extinction record is based essentially on marine invertebates, and the evidence from terrestrial vertebrates is far less clear, with the exception of dinosaurs at the Cretaceous-Tertiary boundary. The recovery after the P/T extinction was extremely long, those species most prone to extinction by high CO2 concentrations had already been wiped out so you wouldn’t expect a further extinction of the survivors. What data for higher CO2 levels do you have post P/T? Trilobites, which became extinct during the P/T had already suffered several extinction events and were in marked decline before the Permian. These events led to a lack of diversity among trilobites which made them vulnerable to extinction. The available evidence regarding which species survived and which died out indicates CO2/pH as the driver, there’s no evidence to suggest that the other volatiles you mention played any role. In particular sulphate is a natural component of seawater in high concentration (after Cl- and Na+). Anthony We need to explore this. The alarmists are saying that global warming/CO2 is affecting the Atlantic Meridonal Overturning Circulation. For those expecting punctuated-cooling, from here, the Pacific may have other ideas. That said, in the past two weeks the SEA SSTA data shows the warm anomaly east of the Phillipines is building back in, once again, so that sub-surface Nino trend may just dissipate. Soes, no warming, and no cooling likely, the next several months, regardless. Ph in the acidic range (<7.0) is nothing for aquatic life to be very concerned about. "In establishing water quality criteria for pH, ORVWSC (1955) stated that, although fish had been found at pH values from 4-10, the safe range was 5-9 and for maximum productivity the pH should be maintained between 6.5 and 8.5." Marine authorities around the world put the safety margin for marine life between 6.5- 9.5. Surely you’re aware that lots and lots of fish, marine mammals, arthropods, mollusks and other animals move between salt and fresh water without let or hindrance. Plants too can occupy both salt and fresh water. Whole industries are based upon anadromous fish, for instance. Yep! Amazing what extremes and ranges of environment some species are adapted to! 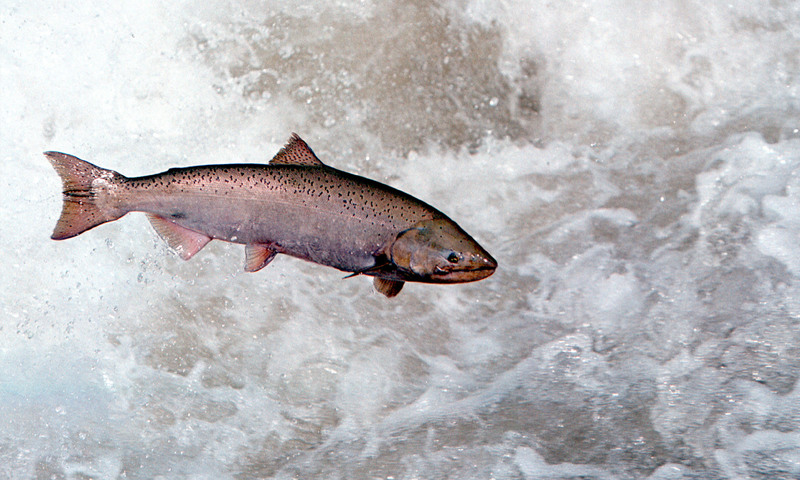 Anandromous fish, such as salmon, don’t feed or drink when they enter freshwater, not exactly ‘without let or hindrance’. You do understand that before the ocean became ‘acidic’…it would first have to become ‘fresh water’. I could see the little wheels turning…as they get ‘that look’. You are bad. I like it. I read the articles and comments frequently at Skeptical Science. Its is astonishing how frequent both the article authors and commentators get basic physical science facts, economic facts and historical facts wrong. Yet somehow, those are the same people that possess the superior intellectual capacity to ascertain the validity of climate science. I guess ‘the look’ accompanied the realization that they were trying to have a discussion with a scientific illiterate? Sea water at pH 7 would still be an impure solution of sodium chloride, certainly not ‘fresh water’! Get a humor detector. Perhaps from eBay. They even sell Nitrogen. And I could drink it. Wouldn’t advise it, too much and you’d die of dehydration! Is it my browser or have paragraph breaks just disappeared from the comments? I’m seeing block text in most comments (not all though), and my own paragraph breaks are being ignored in the comments posted. I have found that I have to put two lines between paragraphs to retain the break that disappears with only one line. Thank you for the tip Clyde. What I always miss in the “ocean acidification” discussion is a view of total numbers of reservoir content. The air-sea gas exchange for CO2 is around 90 Gt outgassing and 90 Gt intake with 2-3 Gt added to the surface ocean per year. The reservoir content of the surface ocean is 1000 Gt! So what could additional 2-3 Gt do? Exactly nothing. And as http://franklin.uga.edu/chronicles/sites/franklin.uga.edu.chronicles/files/Earth_annual_carbon_cycle.png indicates these 2-3 Gt are passed on into the deep ocean reservoir with 37.000 Gt! That’s not really “behind the scenes.” See my quote from the NOAA climate explainers. Nothing about carbonate geochemistry is new… It just got a new name in 2003. Most of that quote from the Smithsonian at the top of the article is pure unadulterated waffle. As somebody who in his life has been paid by the word, believe me I recognise it! The only sentence that counts is the last one and that is pure unscientific scaremongering. Again a good article by David M. nailing yet another of the many myths associated with the Greenblob. What I would like to see is a graphical representation of all? of these myths set against the rising CO2 levels. Actual data rather than anomalies should be used and I envisage that the rising CO2 trace would be seen stark against the more or less flat lining traces of the myths. Admittedly this would require cunning manipulation of the relative scales involved; but as this is a practice well used by the greenblob proponents, they could hardly complain. it could have a considerable influence in the wider community. Sadly I am incapable of doing this; but there must be many who could. I just did a simple calculation of the concentration of CO2 in Soda Pop. Amazingly, nobodies bones have dissolved. What is the pH though…I think it’s very acidic and that’s why kids’ teeth here in NZ are such a problem…baby teeth being extracted on a regular basis. Quite alarming…much more alarming than global warming but gets less media attention. How does that work? Check on how many of those NZ youngsters have been chronically bottle fed acidic apple juice. The rapid (geologically speaking) CO₂ increases at periods of abrupt warming that are captured by stomatal proxies and pCO₂ reconstructions from pH proxies, but not from ice cores, most likely correspond to increased volcanic CO₂ release from enhanced volcanism as a result of ice unloading, as we explored in the article about climate and volcanoes. I was surprised when I saw that deglacial CO₂ contribution by volcanoes might amount to half the total CO₂ increase, and it was added irregularly, preferentially at the Bølling and Pre-Holocene fast melting periods. Peaks >350 ppm CO₂ during the Holocene onset might certainly be possible. Isn’t Fugacity the capital of Globigerina? Well, if they cared, they could ask a biologist. The details of the biological impacts ARE predictable. Pretty well known, if fact. That’s definitely true for marine calcifers that rely on photosynthesis. I’ve read anecdotal accounts of visible greening of plants after a severe electrical storm supposedly from nitric acid rained out from the lightning. Perhaps you meant “When it comes”? I dough knot no what you R talking about. Thank you for this thorough analysis and historical perspective of why ocean acidification fears are totally bogus. Warm water hold less CO2 than cold water, so which came first? Did warming cause release of CO2 from the ocean or did CO2 cause the warming? I vote for the former, not the latter. Not all boomers… I was born in 1958. Towards the end of the Baby Boom, colleges were still generally sane in the late 1970’s. David, I was teaching in the 70s and I can attest from personal experience that it was a period of significant ‘grade inflation’ and also when, in an effort to achieve gender parity, one’s chromosomes became of greater importance than competence when hiring teachers. Also, it was a period of time when the number of administrators increased, and to be able to pay them, the colleges hired large numbers of part-time instructors, with lower salaries and few benefits. We still live with those problems. SCSU may just have been behind the times. David, I need to make an exception for all atmospheric CO2 values besides ice cores. Every proxy for CO2 is influenced by local to regional CO2 levels, not global. The problem is that local/regional CO2 levels can change per hour, per day per month, per season and even over longer periods like the MWP vs. the LIA. All depends of the landscape in the main wind direction and even the main wind direction can change over long periods (like MWP vs. LIA…). Have a better look at fig. 8: while the resolution of the stomata data is 2-4x better than for the ice core data, what is measured are regional CO2 data not far from the main ice melt / freezing events, while ice core data are global within a few ppmv, be it averaged over ten years (Law Dome) to several hundreds of years (Dome C). Take the CO2 “peak” in the stomata data of around 12750 BP. A peak of about 80 ppmv in less than 50 years up and down. That is globally the equivalent of burning about half of all vegetation in a glacial world and regrowth in the same 50 years. Or a sudden acidification of the oceans, but even so the excess CO2 can’t be absorbed in such short time frame, even if the pH was restored. One of these days, I’m going to put together a through analysis of resolution and CO2. Stomata chronologies are certainly noisier than ice cores. However, it has been demonstrated over and over that the application of a smoothing filter to the stomata signal generally matches the Antarctic ice cores. Furthermore, a similar application of smoothing filters to high resolution ice cores (Law Dome DE08) matches the signal of lower resolution Antarctic ice cores. I agree that reefs are not ideal places to measure pH… Too much photosynthesis and other processes going on. However, boron isotopes are about the only way to estimate past pH levels (apart from circular reasoning CO2 calculations). And cores of fossil porites seem to be the main source of boron isotope data. The interesting thing about Kubota et al., is that the low pH levels were correlated with high pCO2 levels. I have written three posts here on Ocean Acidification. It is not informative to rant on about how “ocean acidification” is stupid, a myth, not happening (etc.) because one disagrees with its current name. It might have been better named but there it is — the subject has been given a name and we are more or less stuck with it. Changes in near-surface sea water pH caused by changes in atmospheric CO2 concentrations are expected, do occur and have been measured. In the long-term, it will be reduced in effect by mixing with the deeper oceans. There is, however, nothing scary about it, it can not rationally be expected to cause any sort of extreme change or damage to the sea or its occupants. Kip, I think that the importance of objecting to the term “ocean acidification” is the motivation for adopting the term in the first place. Some have said that it is no big deal, but when presented with a multitude of reasons to stop using it, they keep using it. That tells me that the motivation is psychological and of more importance than scientific accuracy or concern for communication. This is about Psy-Ops, not Sci-Facts. Clyde ==> Of course, the name was chosen for propaganda purposes. Just like Global Warming. Every social/political movement uses this type of word choice. It is not incorrect scientifically — just conveniently easily misunderstood by a scientifically ignorant general public. It is always better to educate as opposed to simple railing against such a choice. When we educate, we expose the duplicity of the propagandists, which has much greater value than simply repeating a silly skeptic mantra by objecting to the name of the phenomena. It is nearly impossible to expunge a term once it has been generally accepted by the general public — unless one controls the mass media. We do not — the Consensus does. So we must fall back on exposing them through education. Just one or two TV science shows explaining that the Oceans will never become acidic and why it is impossible might do the trick. The public does not like being tricked — and reacts with a backlash when these tricks are exposed. This is why the Consensus attacks Crockford with so much ferocity — she educates the general public about the trick played on them about AGW and Polar Bears. It certainly is ‘acidification’, it’s a ten-fold increase in the concentration of hydrogen ions. Then… Why wasn’t the process called “ocean acidification” prior to 2003? It’s not like carbonate geochemistry is a new science. I hear that pickled herring is a popular treat in some countries. The process was not called “ocean adicification” prior to 2003. Technically, it’s called a shoaling of the lysocline or carbonate compensation depth. At least that’s what it was called prior to 2003. It’s not about sounding scary, chemists have never used the ‘less alkaline terminology’. Chemists (I’m one) use the term “acidification” to mean the reduction of pH below 7. And how would you describe the process of adding an acid to a solution to change its pH to 8.0? Phil: I would describe it as “an adjustment of the pH to 8.0”. But then, I’m only a chemist. Yes, which is a good way to describe it, e.g. ‘adjust the pH to 8.0 by adding acid’. You wouldn’t use the phrase, ‘make it less alkaline by adding acid’. But they have used “less basic”. Because chemists don’t find the word ‘acid’ to be scary. Well Arrhenius introduced the concept of acid being due to H+ ions over a century ago, so the idea that increasing [H+] by adding acid to a solution is rather an old one to chemists. It’s been referred to as ‘acidification’ for a very long time. And the process as it applies to carbonate geochemistry has been known since the Challenger expedition. Why wasn’t it called “ocean acidification” from 1891-2003? The Challenger expedition took place in 1872-76 before the modern concept of acids developed by Arrhenius in the 1890s and before the ability to measure the [H+] developed in the 30s (Beckman) and the concept of pH by Sorenson (1909). So I think your claim re the Challenger expedition is flawed. Reasonable calculations of the effect of absorption of CO2 by the ocean started with Callender (1938) but wasn’t really taken on board until the work of Revelle and Seuss in 1957. Following that Sillen was the first to investigate ocean pH (1961). The inability of the technology to adequately measure the changes in pH was noted by Keeling in the late 60s and such work was avoided for decades. Development of suitably accurate measurement techniques proceeded through the 80’s. Since the ability to measure the changes didn’t exist until the 90’s it’s no wonder the term only came into use recently. The inability of the technology to adequately measure the changes in pH is still with us… seawater pH is more often calculated from DIC & TA than it is measured… has a lot to do with being a non-conservative quantity. My 1978 Strat. & Sed. textbook explained the process exactly as it’s understood today, based on the results of the Challenger expedition… 25 years before the phrase “ocean acidification” was invented to scare the Bejesus out of people. You failed to mention the guy on whom I wrote my PhD thesis, German chemist Justus von Liebig. In 1838, he posited a new theory of acids, having investigated the chemical composition of organic acids. His theory of acids suggested that all acids contain one or more hydrogen atoms which can be replaced by metal atoms to produce salts. His definition was widely used for about fifty years, until Arrhenius published his new acids-base theory. However, Liebig’s definition was similar to Arrhenius’ more modern formulation. Liebig correctly stated that acids contain hydrogen, while Arrhenius went further to argue that acids produce hydrogen ions when in aqueous solution. In order to release hydrogen ions, an acid obviously must contain hydrogen, so it’s not as if Liebig were wrong. However, his definition doesn’t say anything about bases, and is therefore limited and mainly only of historical interest today. But in 1872, chemists on the Challenger Expedition had an adequate, as far as it went, concept of acidity. Humphrey Davy recognized that acids contained hydrogen atoms, Leibig introduced the restriction that they could be replaced by metal atoms. Well they had a concept of what an acid was but that certainly wasn’t adequate for: “the process as it applies to carbonate geochemistry has been known since the Challenger expedition”. Are you sure that that knowledge was insufficient? I freely admit that I myself personally haven’t read the Challenger report and assessed its findings against present knowledge of ocean chemistry. But my general impression of late 19th century chemical understanding remains high. It was good enough that my 1978 Strat & Sed textbook cited it as the “discovery” of the relationship between CO2 and seawater pH. What results did they quote for this discovery? Dittmar’s analysis of the Challenger samples (1884) didn’t include pH, but he did determine that the carbonate species were predominantly bicarbonate. Try reading the post. It’s near the beginning… Murray & Irvine, 1891. There’s no mention of pH in the Challenger results, Dittmar found that the carbon species were mostly bicarbonate and was unsaturated at depth (greater than 1500 fathoms). Read the quote from Friedman & Sanders, 1978. Murray & Irvine, 1891, using data from the Challenger expedition, recognized that the proportion of CaCO3 in seafloor sediments decreased with depth. Somewhere between 1891 and 1978, it was recognized that this was due to the relationship between CO2 and pH and that the oceans had oscillated between calcite and aragonite seas throughout the Phanerozoic. By 1983, it was recognized that pCO2, Mg/Ca and water temperatures guided this process. Then in 2003, the process was labeled ocean acidification to scare the Bejesus out of people. First of all, the behavior of an aqueous solution with respect to other materials depends on the pH. That is, an acid will react with most metals (e.g. zinc) to release hydrogen, but (with the exception of amphoteric metals like aluminum) the addition of an alkaline solution to the metal will not release hydrogen. The pH is a convenient way of expressing where on the scale of acid-base a solution resides. Because the dissociation constant varies only slightly with temperature, for all practical purposes the product of the hydronium ion and hydroxyl ion has to be 10^-14. So, what is really important is the ratio of hydronium ion to hydroxyl ion. When they are in equal concentration (1:1), there is no excess to react with other things. If the ratio is greater than 1, then there are an excess of hydronium ions available to react with a base or metal. When all the excess hydronium ions are reacted, then the solution will be back to a pH of 7. On the other hand, if you add a solution of pH 8 to a solution of equal volume of pH 8, you don’t get a reaction. You just double the quantity of solution. In a similar manner, if you add two equal quantities of different alkaline solutions together, you don’t get a reaction, you just dilute the stronger solution so that the resulting solution is the average of the two. Above you insulted me by stating, “My starting assumption is that the laws of chemistry applied in the same way as they do now, something you show your ignorance of in this thread.” I’m not impressed by your vaunted knowledge of chemistry. You are simply parroting the party line of the Alarmists. Not to be picky but pH is actually a result of chemical reactions , not the cause. The reactions happen, THEN the pH changes (or doesn’t). What else might be in the water doesn’t effect pH unless it hinders the chemical reaction and/or is involved in other chemical reactions that effect a pH change. Yes, at least at these very dilute concentrations. The reactions are between the more abundant species, CO₂, HCO₃⁻ and CO₃⁻⁻. [H⁺] is fixed by an equilibrium relation with any of those ions. It is a marker, not a significant reagent. Not at 1e-8M. Well you’ve made so many errors in the chemistry in this thread it’s hard to think otherwise. In a similar manner, if you add two equal quantities of different alkaline solutions together, you don’t get a reaction, you just dilute the stronger solution so that the resulting solution is the average of the two. Try adding 1M Calcium acetate to 1M Sodium hydroxide, what’s that white precipitate? You have been challenged by others with respect to statements that you have made, at least one of whom says he is a chemist. I don’t think that you should get too impressed with your ‘superior’ chemical knowledge. OK, I didn’t explicitly exclude solutions with ions that will react. However, inasmuch as we have been talking about sea water and buffered solutions, I was thinking of solutions with the same species and different pH. I think that you are working too hard to find fault instead of trying to understand the issues. You have been challenged by others with respect to statements that you have made, at least one of whom says he is a chemist. so a ten-fold increase in CO2 produces a ten-fold increase in [H+], hardly “very small”. OK, I didn’t explicitly exclude solutions with ions that will react. However, inasmuch as we have been talking about sea water and buffered solutions, I was thinking of solutions with the same species and different pH. When you made that remark you were not referring to sea water, you opened up with the reactions of acids with metals! Phil: Yes, the math works out that way. If the initial and final two pH are are stated – but only for a static, simplistic acid-base-salt solution! Hence, your math is correct – and simultaneously dead wrong. “Like Nick Stokes, you have no understanding of buffers. A ten-fold increase in [CO2] causes the position of the carbonate/bicarbonate/carbonic acid equilibrium to shift slightly, resulting in only a very small increase in [H+}. Which is wrong, as I pointed out a ten-fold increase in CO2 leads to a ten-fold increase in [H+]. You said “Yes, the math works out that way. If the initial and final two pH are are stated – but only for a static, simplistic acid-base-salt solution! It’s not the ‘math’ it’s the chemistry. The statement made about buffers was specifically about the ‘the carbonate/bicarbonate/carbonic acid equilibrium’ which is exactly what I responded to. So an approx. ten-fold increase in CO2 gives ~10-fold increase in [H+] and ~10-fold reduction in [CO3^2-]. During the Permian mass extinction pH decreased by ~0.7 which is a 5-fold increase in [H+], corresponding to pCO2 of ~2000 ppm, a 5-fold increase over today’s value. 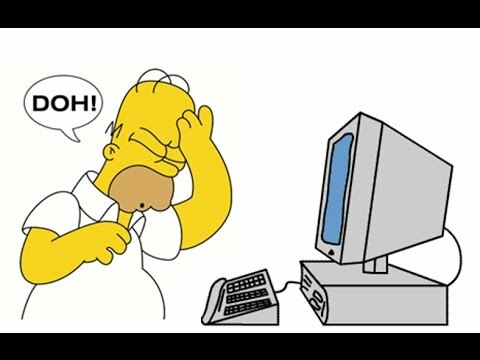 Sorry it appears that the link system no longer works. Now it’s back to normal, thanks Anthony. Interesting how there was a peak in atmospheric CO2 above 400 ppm in southeastern Sweden about 10,700 BC, even though the Antarctic ice cores don’t show much change. I don’t think we can blame prehistoric Vikings for burning too much whale oil back then. This demonstrates the fallacy of using Antarctic ice cores to estimate the “global average” CO2 in the atmosphere. The CO2 in the Antarctic ice cores got there from snow falling on the Antarctic, which was probably dissolved in a water droplets somewhere south of the Antarctic Circle which froze into a snowflake and fell on the Antarctic. The ice core record might be a good proxy for CO2 levels south of the Antarctic Circle, but most CO2 exchanges between the atmosphere, ocean, and living organisms occurs in much lower latitudes (over a much larger area of the globe), and these changes are not reflected in the Antarctic ice cores. Even southeastern Sweden is not exactly tropical, but it’s warm enough in spring and summer to grow birch trees. What if there was a proxy for prehistoric CO2 levels in tropical areas, where most of the CO2 exchange between the atmosphere, oceans, and living organisms occurs? The Antarctic ice cores are very suitable for 100-500 year average CO2 values… A few have 50-100 resolutions. The DE08 core from Law Dome has 10-30 year resolution back to about 2,000 years BP. The Antarctic ice cores aren’t wrong. It’s just that they can’t resolve century-scale CO2 shifts in the Early Holocene or Pleistocene. The ocean contains 94% of all the available carbon, the atmosphere contains something along the lines of 2.5% and the plants contain the rest. How exactly can adding that tiny little bit of carbon to the Ocean cause more than trivial changes? News flash, all these sea animals that are claimed to be at risk all have blood that is far more acidic than the Oceans, and their shells do just fine. Your bones also do fine with the acidic blood as well. You’ve uncovered another shocking it’s-worse-than-we-fort we-must-act-now alarminglyly damaging effect of CO2. Politically mandated revisionist research aimed at showing that everything that has ever happened is bad and that CO2 is to blame, destroys the researcher’s ability to distinguish cause from effect. It ultimately erodes that researcher’s understanding of the difference between – and even the meaning of – cause and effect. This is scientific blatherification and is the most profound and real danger of CO2. O look – that naughty CO2 was jumping around all over the place even way back then – just think of all the bad stuff it must have been causing! CO2 blatherification is worse than we thought. According to google ngram viewer, “ocean acidification” was never used in a book (that google books has read), encompassing 1800-1976. It may have been used once, in a book in 1977 (”Search for “ocean acidification” yielded only one result.” but I could not find the book) and was not used again until 1992; but it was used more frequently since 2002. Using Google Scholar, I find no scientific literature using the phrase, “ocean acidification” 1700-1954; I stopped there because of all the erroneous dates began to show a pattern of bad clerical work … anyone interested in further research to prove invalid, the various “hits” past 1954? Great stuff! I’ve been rooting through papers on the Paleocene-Eocene Thermal Maximum (PETM), a period of actual “ocean acidification” (shoaling of the lysocline), and I’ve found several papers post-2003, that don’t mention “ocean acidification.” Although, it appears that since 2007-2009, it has become a common phrase in PETM papers.